Cheerful Unicorn BILINGUAL BOOK FOR KIDS: ¡Aprende inglés con los unicornios! 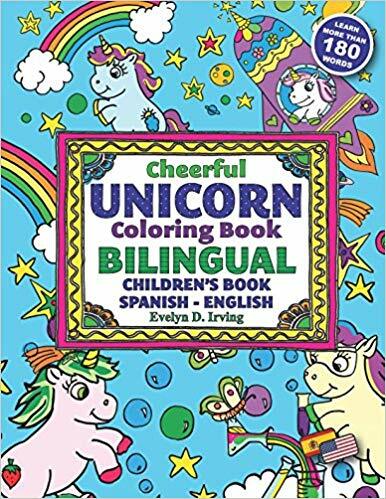 In this bilingual coloring book for kids you will be able to color and learn more than 180 English and Spanish words, with the help of your cheerful unicorn friends! Learn English and Spanish vocabulary about the beach, outer space, school, dinosaurs, professions and many more interesting and useful things! This is not only a bilingual children’s book, but also a great activity book for bilingual children or kids who are learning Spanish. This unicorn coloring book is great for unicorn lovers, boys and girls. It has more than 50 pages to color and learn languages. The book includes words AND sentences, so that children can learn Spanish grammar and sentence structure, and not only loose words: the way the book is structured helps children to understand how the language works, so that they can learn it almost effortlessly. A great bilingual coloring book in English and Spanish, full of witty and cheerful unicorns!